For most of us cat owners, the noise of a loud meow is something we come across daily when our fur babies are hungry or need attention. For one family, these loud meows belonged to find a stray tabby cat asking for help, right outside their front door! The shaken up kitty was clearly injured badly on his front leg but had made it to the porch of this families door in hopes of finding someone to help him survive. On February 25th 2017, this kitty had some serious nerves to turn to a stranger's welcome mat for a remedy. However, he had extremely good luck as this family was definitely happy to help. The cat had a severely swollen leg and was clearly badly injured in one of his back legs. After noticing this and hearing his cries of pain, the family decided to get some medical assistance for the little guy and drove him to the vet. The lucky orange tabby was looked at by the vet who then required some x-rays and a check up, just to be safe. The injury was then concluded to be a result from another feline getting a bit rough and injuring the stray kitty by biting him and causing a nasty infection within the skin. The x-rays came back with no obvious breaks to the rear leg, but there was a small fracture on one of his front legs which caused him to be a little bit wobbly with a limp when walking. Two days in the hospital were required for the cat, as he began to feel much better as his injuries healed while taking antibiotics as a treatment. He was riddled in fleas and ticks which made him constantly itchy on top of the nasty injuries but was also given extra medical attention for his parasites. The same family who was willing to help in the first place was there for the gorgeous tabby once he had been feeling a lot better. They picked him up and took him home with them, where they continued to treat his sores for another five days, including administering intramuscular shots which were a part of the medical treatment that the stray needed to have in order to keep healing. He licked at his wounds in order to clean them but was also again helped by the considerate family who cleaned his injuries and sores with antiseptics as well, in order to keep him healthy and on the road to full recovery. Healed and happy kitty poses for the camera! 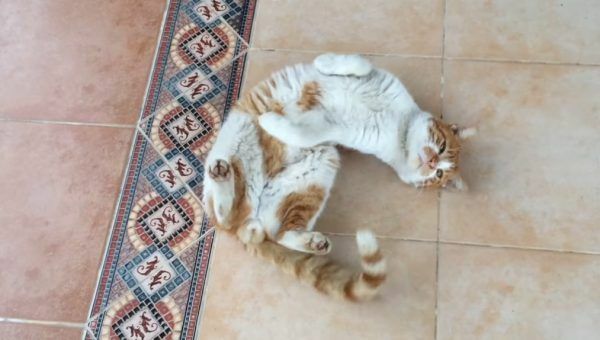 The poor cat was weak and helpless when he arrived at the families front door for help, but because of their incredible kindness, this cat has been given a shot at life and now even has a family who loves him. After the five days of consistent treatment to his injuries, he was up and ready to go outside and face the hardship of the world again. Let's hope he doesn't bump into the same cat that caused his injuries the first time again. Although if he does, at least he knows whose door he can go running to. Cats just 'know' where they need to go in order to seek help. And it was super lucky that the response was so positive. You might just be chilling at home when someone knocks on your door, or you hear a little 'meow' cry for help. Unlikely pet bonds are not so unusual between humans and cats, but what IS unusual is this duo. Meet this Bengal cat and otter who became best buddies. It's adorable!